After graduating in 2011 with a Bachelor of Science degree in accounting, Javen Richardson continued at Monmouth in the Master of Business Administration (MBA) program, this time focusing on finance. As a graduate student, Javen took multiple classes each semester while working full time at McGraw-Hill Financial, Inc. (MHFI), where she began working as an intern in 2010. 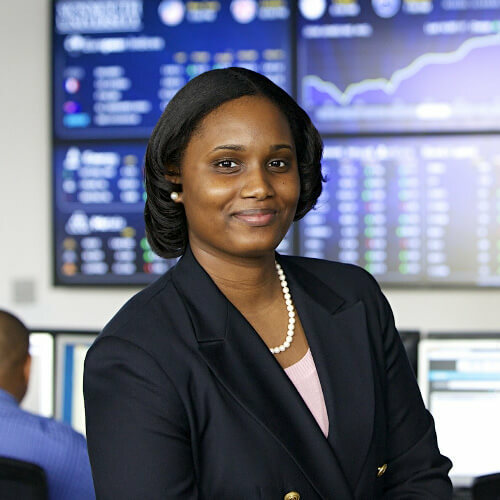 With the support of her employer and guidance from the Leon Hess Business School, Javen earned her MBA in 2013 and continues to progress in her financial career. Currently, she works within MHFI performing financial analysis and accounting functions specializing in contract and supplier management. Both Karl Gordiner and Jeff Mass, from Career Services at Monmouth, offered a great deal of guidance to me as an undergraduate student. Their services included career advice, mentoring, interviewing skills, social etiquette, and help during fall/spring career days. They also aided me in expanding my network of business contacts. In addition, Doug Stives, the MBA director at Monmouth, was not only my professor for Individual Income Tax and Business Income Taxation as an undergraduate student, but he also helped me in the MBA program by providing focus and direction. He helped me to determine my area of focus, as well as which classes would be the most useful for my career. His guidance helped me stay on track to graduate on time with my MBA in finance. The small student class size at Monmouth was conducive to building relationships with professors and fellow classmates, aiding me in achieving my goals. In addition, the MBA program at Monmouth offered a track in finance, which is the area in which I wanted to focus. The University's course offerings were also flexible, with courses on different days and times. This allowed me to gain work experience in my field of study, in addition to completing my course work. Furthermore, Monmouth has an abundant number of programs and events offered to students, such as the Accounting Honors Employment Program (AHEP), fall/spring career days, and keynote speakers who provide real-world guidance related to job preparation and career expectations. New Jersey Society of Certified Public Accountants (NJSCPA): In 2009, I attended the NJSCPA Scholars Institute, where we stayed on the Monmouth campus for two days and engaged in a number of activities, including how to break the ice and how to meet and engage with other professionals. I also received advice about becoming a certified public accountant (CPA). National Association of Black Accountants (NABA): I attended a convention in 2009 that provided the opportunity to meet other professionals, interview with large corporations, and attend seminars that offered insight into the particular areas of accounting that interested me. New Jersey Young Professionals (NJYP): I attended networking events to meet other young professionals like myself and to connect with and seek guidance from professionals in my area. Big Brothers Big Sisters of Monmouth & Middlesex Counties (BBBSMMC): I mentored college-bound high school students by advising them on college planning, as well as what they should try to accomplish while in college. I participated in the Global Understanding Convention. I also joined the accounting group, which held weekly meetings. These meetings occasionally included guest speakers who were former Monmouth graduates with careers in accounting. These speakers provided valuable career advice and direction to meeting attendees. I am proud to be a part of Monmouth because I value and embrace "where leaders look forward." I want to be a part of a university that supports their students and faculty and maintains a beautiful campus. When you are at Monmouth, it feels like home, not only because everyone around you is very personable, but because everyone is here to help you succeed and become a leader. I am a Monmouth Hawk who studied as a student and graduated as a leader. I am an example of a strong individual who soared at Monmouth and will always be proud of being a Monmouth graduate. I have four great memories while attending Monmouth University: first is the memory of being mentored by my father, Carlton Richardson, a former Monmouth employee, as he guided me through both my bachelor's and master's degrees; second is graduating with my mom, Melissa Richardson, who earned her Doctor of Nursing Practice degree this past May; third is taking pictures at Wilson Hall with my family; and last is spending time with my very best friend, Patience Tongesayi, who also earned her MBA at Monmouth."